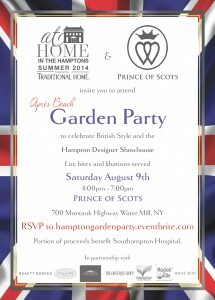 Experience the Modern Luxury Lifestyle of Prince of Scots with their award winning collections, exclusive brands, and The Concept Collective (see below for more information). Get acquainted with the designers and shop their collections in our tranquil garden venue with décor accents presented by West Elm. Complimentary beauty services will be available from Beauty Booked, as well as spray tans from Gotham Glow, and blowouts from Blow Hamptons. Treat yourself with light pastries from Financier Patisserie and chilled soup from Rockin the Ladle along with the night’s signature cocktails and water presented by Resource Water and San Pellegrino. Doors officially opened June 6th and will remain open through Labor Day. The event is complimentary to attend. The Concept Collective includes Italian leather handbags by San Francisco based 49 Square Miles that capture rugged beauty and independent spirit; architecturally inspired eyewear by Haze Collective in ultra premium vibrant hues; Brooklyn based jewelry by AEA, which distills a mix of abstract forms and futuristic influences into clean, modern monuments; dresses by Yumi Kim in vintage silhouettes spun with a contemporary urban feminine mystique; and hand-woven Moroccan loafers by Cobra Society that evoke a heritage of ancient times, yet street style for today’s fearless fashion influencer.